Before becoming a parent, you could head out the door on a whim, carrying no more than the contents of your wallet. Since your baby has joined the family however, travelling light probably seems like a distant memory. For many parents, getting ready for a simple shopping trip entails packing up the nappy bag and lugging a heavy stroller. While many parents choose to travel with a lot of gear, some have found that by utilising a baby carrier or baby sling, they can get around much like they did before parenthood... well, almost. Baby carriers and slings come in a wide variety of sizes and styles. Some slings are merely long cloths that when tied properly, will hold a baby securely in place, while the largest carriers are rugged enough to accommodate a fairly large child on outdoor hikes. Depending on the intended use, comfort is an important consideration for both baby and parent. Lightweight baby carriers are good, especially in warm weather or for extended use. Many have soft, absorbent fabrics, such as flannel or terrycloth, in all places that will come into contact with baby's skin. Most have adjustable straps so that they can be used by parents of various sizes with a quick adjustment. When choosing a carrier or sling, it is wise to try several in the shop before making a final decision. The carrier that your best friend prefers may not be the one that feels best for you and if it isn't comfortable, you won't use it often. 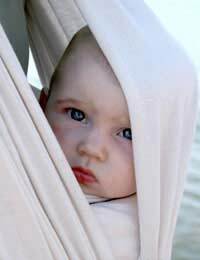 Some carriers and baby slings are designed for babies of specific weight and developmental levels. Many offer little in the way of head and neck support and are useful only for older babies and children who are able to support their heads for extended periods of time. This is usually the case with large framed carriers since these are typically favoured by athletic parents wishing to include their children in hikes and nature walks. Young babies often find comfort in snuggling close to a parent or other caregiver, so front placement carriers are usually the best choice in the beginning. Some of these baby carriers can be converted to a backpack style as baby grows, making them economical choices. A few models allow baby to ride on a parent's back, facing either forward or backward, which allows babies to have an open view of their surroundings. No matter which type of baby carrier or sling that you use, be sure to familiarise yourself with the manufacturer's recommendations for use and follow the guidelines closely. Producers of baby items go to considerable lengths to test their items to determine their limitations; never assume that the baby carrier will hold more weight than the instructions advise. If you are given a hand-me-down baby sling or baby carrier, check it over carefully to be sure that all parts are included and in good condition. Fabric seams should show no signs of fraying or excessive wear -- never place your baby in a carrier that is in less than ideal condition.